Two Southwest Research Institute (SwRI) instruments have been selected for a NASA mission to Europa, which will launch in the 2020s to study this large, potentially habitable Jovian moon. The Mass Spectrometer for Planetary EXploration (MASPEX) and Ultraviolet Spectrograph (UVS) were selected from 33 candidate instruments for the yet-to-be named mission. NASA selected nine science instruments to explore Europa, Jupiter's fourth-largest moon. In the 1990s, NASA's Galileo mission yielded strong evidence that Europa, about the size of Earth's moon, has a liquid ocean beneath an icy crust of unknown thickness. If proven to exist, this global ocean would have at least twice as much water as Earth. "We now have the chance to finally search for potential life in the outer solar system," said Dr. Hunter Waite, principal investigator of MASPEX and a program director in the SwRI Space Science and Engineering Division. "Europa is one of the most intriguing places in the universe because it has an internal ocean with liquid water and signs of potential hydrothermal activity." "UVS will hunt down potential plumes spewing from surface cracks on Europa and study them," said Dr. Kurt Retherford, principal investigator for the UVS instrument and a principal scientist at SwRI. UVS will look at the composition and chemistry of Europa's atmosphere to understand its source, structure, and variability. It will search for and characterize plumes in terms of activity and the nature of subsurface water reservoirs. "We will confirm earlier Hubble Space Telescope findings and learn how the plumes behave - when they start, stop, and move around." "Once UVS chases down the plumes, we will fly through them with our mass spectrometer," said Waite. The spectrometer is designed to measure the composition of volatile gases found in Europa's atmosphere. Measuring molecular and isotopic composition will offer insight into the oxidation state of the moon's subsurface ocean and potential metabolic energy sources. "MASPEX will have by far the highest sensitivity for identifying, measuring, and sampling gases of any mass spectrometer ever flown in space. 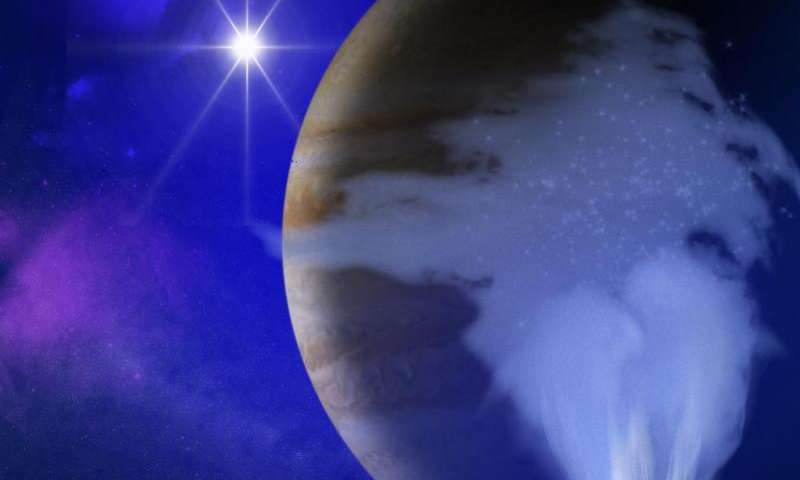 With these precise measurements, the composition of the gases will reveal the story of the interior, and whether the conditions for life exist beneath the icy surface of Europa," Waite explained. MASPEX is a new instrument funded by both internal SwRI funding and NASA instrument development funding. Significant advances have been made over past mass spectrometers flown in space, and this mass spectrometer "blows everything else out of the water," according to Dr. Curt Niebur, lead program scientist of NASA's New Frontiers Program. The MASPEX instrument team includes scientists from SwRI, SETI, Washington University, Arizona State University, the Imperial College London, and the University of Franche-Comté. UVS is based on the Alice spectrograph already flying onboard the ESA Rosetta comet mission, the NASA New Horizons mission to Pluto, and the Juno mission to Jupiter. The newest version of UVS will fly on JUICE, the future ESA mission to the icy moons of Jupiter, as well as the NASA Europa mission. The UVS instrument team includes scientists from SwRI, Johns Hopkins University, SETI, the Royal Institute of Technology in Sweden, and the University of Cologne in Germany. "Having two UVS instruments in the Jupiter system making measurements will offer exciting complementary science possibilities," said Retherford. JUICE is primarily studying Ganymede, but will fly past Europa twice. These missions will likely overlap. NASA's fiscal year 2016 budget request includes $30 million to formulate a mission to Europa to launch sometime in the 2020s. The mission would send a solar-powered spacecraft into a long, looping orbit around the gas giant Jupiter to perform repeated close flybys of the moon over a three-year period. In total, the mission would perform 45 flybys at altitudes ranging from 16 miles to 1,700 miles (25 kilometers to 2,700 kilometers). NASA's Science Mission Directorate, which will be responsible for planning and operating this mission, conducts a wide variety of research and scientific exploration programs for Earth studies, space weather, the solar system, and the universe.